British Beatles Fan Club: Review: The Fab Four "Hark!" -- Possibly the Best Christmas Album Ever! 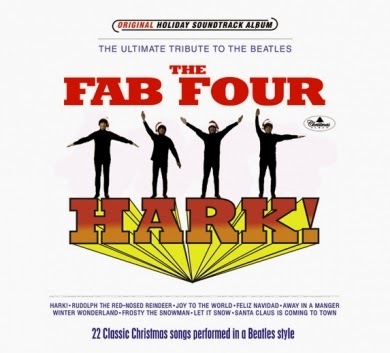 Review: The Fab Four "Hark!" -- Possibly the Best Christmas Album Ever! I'm not usually a fan of albums by Beatles tribute bands. I think that tribute bands are great for live performances; after all, it's not like we can see the Beatles perform live. But, if I want to listen to music, I'd much rather listen to the originals. I mean, there really is no-one quite like the Beatles. But this album is different! Hark! by The Fab Four is a collection of traditional Christmas songs and carols that are all performed in the style of the Beatles. And although that may sound strange, the combination really works, and it works brilliantly! While Beatle purists may shudder at these adaptations, for me they captured the fun and sense of humour of the Beatles. The album also reflected the creativity and ingenuity that exuded from everything the Beatles did throughout the 1960s and beyond. I don't want to go into any details about the various song combinations because half the fun is the surprise when a Beatles song morphs into a Christmas song ... but you'll probably never think of Jingle Bells in the same way again! Each combination, though, works perfectly, reflecting the musical ability and talent of The Fab Four. My only criticism is that the attempt at Liverpool accents sometimes falls short and listening to Winter Wonderland was a little bit painful, but the clever substitution of some lyrics ("honey pie" and "flaming pie" for "pumpkin pie") more than made up for it. If you love Christmas music and you love Beatles music, and you have a sense of humour and sense of fun, then this CD is a must! Hark! is available both as a CD and an instant download (via amazon and itunes). For more information about the album, and how to buy, visit The Fab Four's website by clicking HERE! 4.) Hark! The Herald Angels Sing 15.) What Child Is This?